"Actually, I'd prefer some coffee, if it's all the same to you." 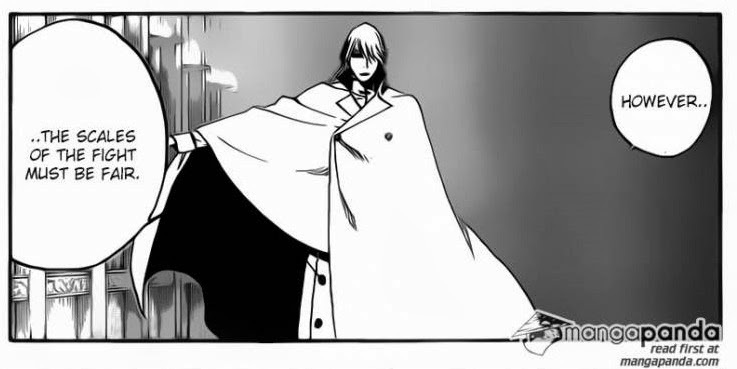 Jumping back, Shunsui gives Nanao a signal, and she activates another barrier, saying that in the time it took Haschwalth to absorb her barrier, she was able to create a new one. Pointing out that this barrier is different, Haschwalth says that it looks weaker than the previous one, but admits that it’s most likely a trap to lull him into a false sense of security. Just as he prepares to use a more violent method to break through, he’s summoned back to the main base by Yhwach, leaving Shunsui and Nanao alone. Meanwhile, Ikkaku and Yumichika notice that night has fallen, and discuss the fact that the shadows are lengthening. From behind them, Shuhei appears, and tells them that he got lost due to the unfamiliar landscape. As Ikakku says that moving around at night would be dangerous, they’re ambushed by Mask De Masculine. Seriously? There are three of you, how can your blind spot be that large? In Yhwach’s palace, Cang Du and BG9 are chained to poles. As Yhwach gives an order to Haschwalth, BG9 behaves extremely uncharacteristically and yells that he can still fight due to the release of the Vollständig. Haschwalth says that they were lucky to survive, and now he must give them an amount of misfortune in order to balance the scales. Cang Du simply bows his head, and seems to accept his fate until he simply blocks Haschwalth’s blade by activating his power. After saying that he refuses to be killed by anyone but Yhwach, Haschwalth shows him a huge pair of scales, and slices him in half. 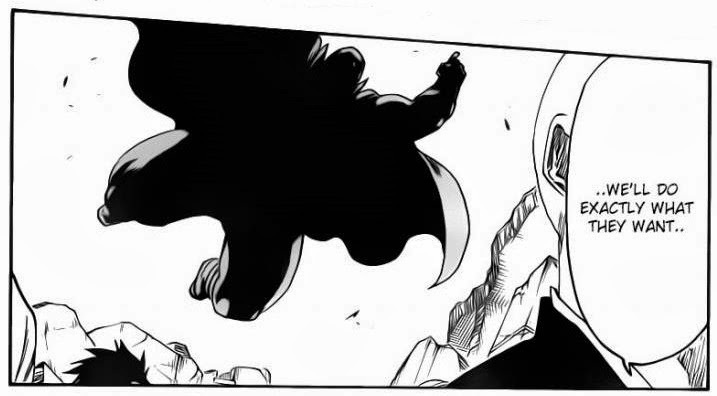 Back with Mask De Masculine, he repeatedly pummels Ikkaku, Yumichika and Shuhei into the ground, and then talks to a little minion, saying that he managed to defeat almost all of the Captain-ranked Soul Reapers he found. As he laughs, he notices two points of light fall from the sky, which are revealed to be Rukia and Renji. Haschwalth’s confrontation with Shunsui seemed pretty pointless, as all he did was break through one barrier before leaving, and I was looking forward to seeing those two fight. From the way things are going, it might be a while before that happens. The same could be said of Ikkaku and Yumichika’s scenes, as all they did was meet up with Shuhei before being ground to a pulp be Mask De Masculine. Really? A few pages ago you were talking about tipping the scales in your favour. However, the scene with Cang Du and BG9 was somewhat interesting, as it showed that BG9 isn’t completely emotionless, and it revealed a little more of Cang Du’s powers – namely, his ability to be undamaged by weapons by (apparently) turning his skin into iron. Also, given the fact that he wasn’t sliced perfectly in half (in fact, it could be that he only lost his right arm), it’s entirely possible that he’s still alive, and so the chances are that BG9 will survive as well. 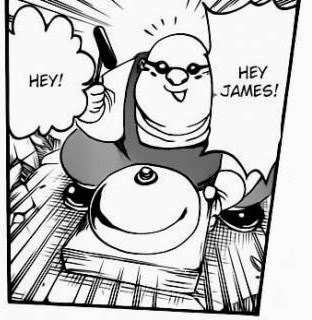 I have seen you for all of one panel and I already have an instant hatred towards you. The appearance of Rukia and Renji was confusing, as I was under the impression that they had left the Squad Zero barracks after Ichigo. If that’s the case, then how come they’ve arrived in the Soul Society first? You’d have thought that the Squad Zero Captains would have shown Ichigo the quickest way back, and in this case it seems like he should have gone with Rukia and Renji. To be honest, I found this chapter pretty underwhelming. It didn’t seem to advance the story in any way, and only really served to set up more fights and events. Good Things: Rukia and Renji appear. Possibility of conflict between Cang Du and Haschwalth (if he survives). Bad Things: No fight between Shunsui and Haschwalth. Three Lieutenant-level Soul Reapers got beaten that easily? ClayDragon is currently studying Physics at university, and is constantly bewildered by it. The main method of contacting him is his Gmail account at kyleroulston1993@gmail.com. The alternative is his Skype account at kyleroulston1993. When not playing games or reading, he can be found with his head in his hands whilst trying in vain to understand quantum physics. He is family-friendly. So nothing much happens in Bleach? Really? That's never happened before! Seriously, Bleach, espesially the Hueco Mundo Arc, has pacing that could give Dragon Ball Z a run for its money. Let's break down Bleach page by page, panel by panel. Haschwalth: Bored emo looks. Shunsui: Hint-of-a-smile Bored. Page 2: Unecessarily close up of bored Hasch, and another close-up of a sword which is apparently being unsheathed. He takes the sword and looks serious-bored. He says something about scales, which is apparently his theme. Super close-up of shunsui's eyes, and changes expression to serious-bored, showing that Nanao is behind him. Was she there before or after? Apparently there was movement involved. Page 3: Explosion, whoopdeedo. Something happened. Shunsui is smiling, saying that he forgot Quincies can absorb reishi. Apparently Kubo forgot as well, there were at least a dozen times that could have been used. Despite having theeffort to paste screentone on Shunsui's clothes, he does not have the effort to pull back the camera. 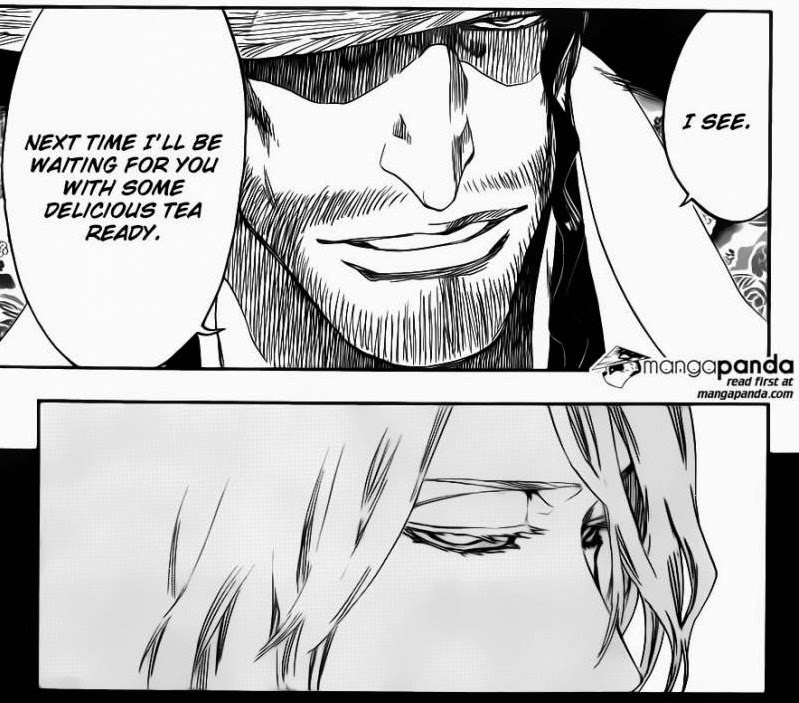 Cut to Nanao, who is behind Shunsui. Just like before. What happened? What was all the movement lines before? Where did they move? We can't tell if we didn't see their relative positions. 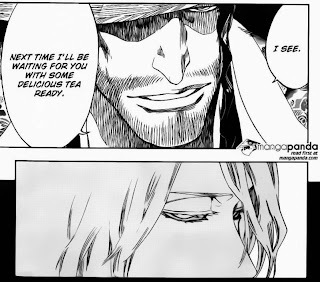 We can only see half of Nanao's happy face, and no face from shunsui. Can't have too much emotion. Page 4: Apparently Nanao set up a screentoned barrier, cut into hexangons. You think instead of doing difficult screentone, Kubo could spend time doing establishing shots. Nanao is happy-determined, sweating in the Icey Quincy palace, so she must be putting a lot of energy in not fighting. Hasch continues to be bored. I'll continue later. I never expected some much from a page by page review of Bleach, there's so much stuff to object to. 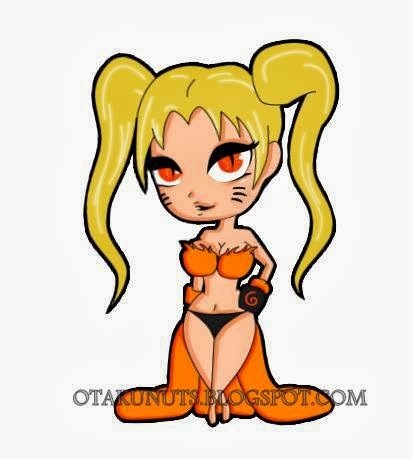 Just look at it.